Photo courtesy of Live the Stream. Joe Humphreys seems every bit the veteran fly-fisherman, wearing waders, a ratty, decades-old vest and a face full of character that doesn’t hide his 87 years. Then a crowd masses on the riverbanks, or another angler asks for a photo, and you realize you’re in the presence of something more: Fishing royalty. 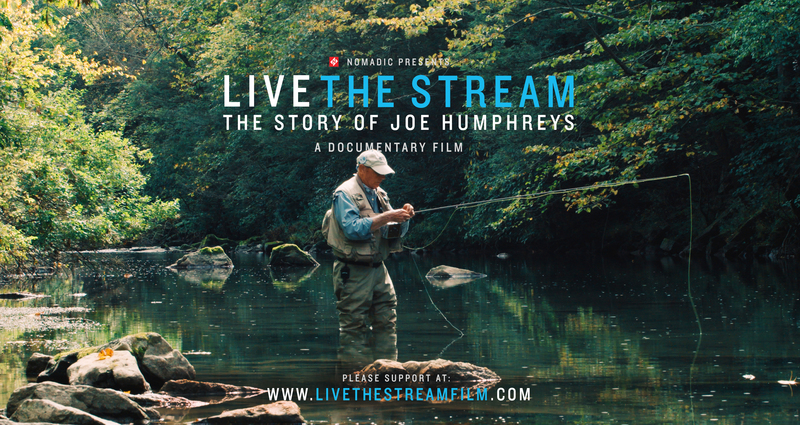 Now the story of Humphreys ’57—so highly regarded for his fishing skills that his company has been sought by statesmen and celebrities alike—has garnered the interest of filmmakers who are wrapping up shooting of “Live the Stream,” a documentary about his life. Fly fishing’s serene waters and graceful casts of the line may seem the antithesis of an engrossing feature-length film, the humility, genuineness, and joy Humphreys continues to exude somehow exhilarate the viewer, elevating a sport to art. After Penn State, Humphreys coached and taught before also establishing one of the first high school fly-fishing programs. In 1970 came the realization of a dream, a return to Penn State to lead the angling program started by his mentor, George Harvey ’35. His time at Penn State spanned almost two decades. Humphreys has traveled to world championships, penned two books, and hosted an ESPN series. Still, when the husband-wife team of Lucas and Meigan Bell approached him with the idea of a film, he was surprised his story would be interesting to a wide audience. Lucas Bell ’02 met Humphreys while filming a history of the angling program as a film student at Penn State. After reconnecting with him last year at a fly-fishing show (the Bells, too, are aficionados), he had the idea for the project. His wife was sold soon after meeting Humphreys. Entry filed under: Alumni, From the Magazine, The Penn Stater Magazine. Tags: Fly Fishing, Joe Humphreys, Lucas Bell, Meigan Bell. At the National Aviary, Birds—and Penn Staters—Abound	We Are … in Peru?? ?